My design philosophy with Stars Fall Up, and most of the TRPGs I design from square one, is to start with the simplest example of a role-playing game. Two people; person one tells person two about a scenario they are in. They are in a 10×10 ft room with a door and an orc. What do they do? Person two asks for details; does the orc look hostile? Is there anything else in the room? They make a choice. I make a break for the door. I draw my weapon and attack the orc. Player one tells them the result of their action. They manage to kill the orc. He has a key on him. The door is trapped with a poison barb. Your vision starts getting blurry. What do you do? That’s all there is to it. That’s roleplaying; as long as those two people can maintain their shared imagery, you don’t need rulebooks, character sheets or dice. To this end, everything we game designers make is extraneous. But if people didn’t want them, there wouldn’t be a TRPG market in the first place. So, my design philosophy is, how much further do I need to go beyond this most basic interaction of roleplaying? What can I make that feels necessary, or desirable, for a game experience? The thing is, even though that kind of minimalist roleplaying sounds easy to do, it’s really not. It’s sort of like watching someone do improv comedy; if it seems easy, it’s because the actors are really good at it. Quality improv, which lends itself heavily to immersive roleplaying, requires a vivid imagination, strong communication skills, and ripens only with long hours of experience and the disappointment of past failures. If you have five minutes and another person nearby, try out that scenario above of minimalist roleplaying. The longer you do it, the more difficult it gets to maintain a compelling narrative. So that’s where rules come in. Written down and easily referenced, game rules put all players on the same page and salvage them from the paralysis of choice; what do you create when you can create anything? It’s too big of a burden for most folks. Dice grant a new level of immersion; the fate of the players’ characters rest outside of their control, and they must adapt to the ebb and flow of their fortune. But how much is too much? How many rules do we need? When I think about creating TRPGs for brand-new and fledgling players, I look at the volumes of rules for games like Dungeons and Dragons, or Pathfinder or GURPS or World of Darkness and I think no, that’s just too many damn rules. I’m not saying those systems are worse off for being more complex. But the way I see it, out of every 10 people who approach TRPGs out of novice curiosity, only 1 or 2 of those 10 will make it up the harrowing learning curve to find the quality that lies within those hefty tomes. The other 8 or 9 will flip through a few chapters and put it right back on the shelf, figuring they were right, roleplaying isn’t for them. But wait, I want to say. Of course it is. I believe that roleplaying is for everyone. Yes, every single person out there. Maybe you won’t like it in the form of DnD, but perhaps you’ll enjoy Universalis. Don’t like World of Darkness? How about Apocalypse World. Not into Unknown Armies? Try Fiasco or Dread. Or use the d6 system; the rule is, say what you want to do and roll a six-sided die. The GM tells you what happens based on your roll. There, enjoy your free TRPG. You can fit it on the back of a goddamn paper slip from a fortune cookie, but my friends and I have had whole evenings of fun using this system. 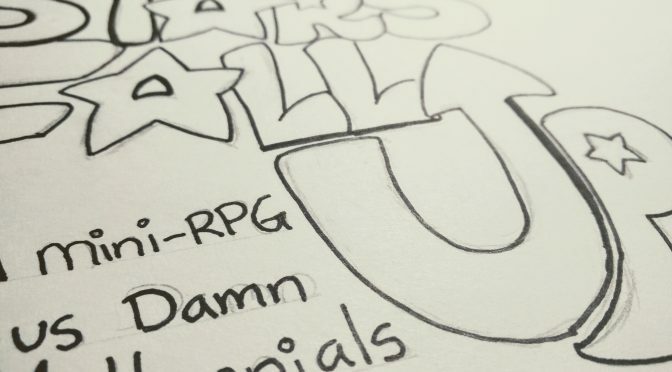 Stars Fall Up is a game for Us Damn Millennials, many of whom are not experienced gamers. I want to make sure SFU is accessible to those people too, and to that end, I want to make the entirety of the game fit into a zine format. Readable in 10 minutes or less, and able to fit into a back pocket. Something people can pull out and share at a moment’s notice, and let their curiosity grow into interest, into love.